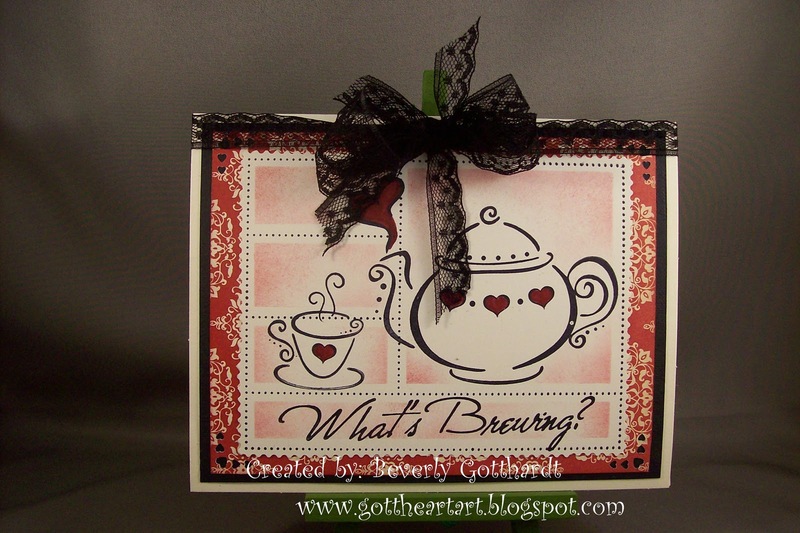 Gott Heart Art: What's Brewing? 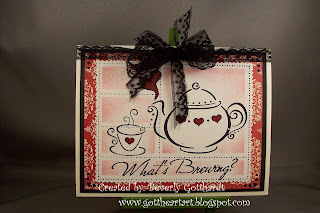 Here's another creation for Gingersnap Creations Challenge Blog. I really like how they have a lot of different challenges throughout the month and they run for a couple of weeks to a month at a time. That gives me time to mull things over and hopefully come up with some quality creations. Some days like today the ideas just flow, but some days I need a little bit of mulling and time to dig through my stamps for just the right combination. Supplies: Ivory Card Blank 5" X 6 1/2" Halcraft, Papers: Stampin Up-Basic Black, Very Vanilla, Love Letter Designer Series Paper, Stamps: Just For Fun-Faux Postage, Rubbernecker-teapot and teacup, Ink: Ranger Archival Ink-Jet Black, Stampin Up-Cherry Cobbler and marker, stiple brush, Fiskars paper edgers scissors-stamp, Fiskars corner border hearts punch, Stampin Up-Trim Lace Raven, glue dot.